I Don't Know is the required confession needed to be granted admission to the path of enlightenment and to The Way of Knowing. I Know is conclusive, ending, finite and therefore devastating. I Know is an enemy of immortality and nemesis to The Way of Knowing. We are all infinite spirits and the offspring of the Infinite Creator. When we discover the I Don't Know within we unleash our Infinite nature and unearth the Endless Us! Are you ready to put on immortality? THIS BOOK IS SOLD OUT - IF YOU WOULD LIKE TO ORDER, PLEASE CONTACT US AND WE WILL KEEP YOU ON OUR WAITING LIST IF WE RE-PRINT THESE BOOKS IN THE FUTURE. YOU CAN REACH US AT (404) 243-5020, info@mytruthsanctuary.org OR CLICK HERE TO USE OUR ONLINE FORM. -BISHOP YVETTE FLUNDER, D. Min. -BISHOP JOHN SELDERS, JR., CLS, D.D. -DR. HAROLD LOVELACE, D. D., M. Th. Hatred ceases not with hatred. This is love: not that we loved God, but that He loved us and sent His Son as an atoning sacrifice for our sins. We love because He first loved us. God loved us first! Not the converse. Our love for God did not instigate or serve as a catalyst of God’s love for us. Our love (human love) for God is laced with humanity and therefore is merely a response to being loved. Thus, without ascending to a higher consciousness our love will always be a response – it will always be conditional. God’s love for us is not a response to anything. God’s love for us flows from His very essence – God is a being of love! Human love struggles to understand Christ’s ideas of loving, blessing and praying for enemies because human love is responsive – conditional. Godly love is emanating – unconditional. The reason God’s love is unconditional is not only because it happens to be a greater love, but because it is who God is! God’s love flows from being Himself. For God not to love would be a denial of self, God’s self. God, the I Am, does not respond - God just is. So God’s love for us is not an action, it is just an expression of God’s being. If God’s love is not an action, but a state of being, then it is not predicated or dependent upon action or response. Believing that we could cause God not to love us by our non-response or un-belief makes the assumption that we have the power to change the I Am of God or to transform the very beingness of God. God does not respond, much less react. God is not ill-tempered, temperamental or emotionally fragile. God being God is not affected by His creation. When we respond to God as love (God’s emanating love) we begin to grasp the deep mysteries of what love is. We begin the journey of becoming love and no longer remain stuck for a lifetime trying to learn how to love and who to love. Our response to God by showing Him love does not make God love us more. Our love for God only awakens us to our own capacity to love – to the beauty of the godly love that was hidden within us all along. We awaken to ourselves as love, not just as loving. When the God as love is revealed to us we become reacquainted with our beingness – our being like God – our being love. Love can carry no separate definition than that of being unconditional. How could love be anything other than unconditional? If love is conditioned or conditional it is not love – it is a response - an emotional response based in self-preservation, motivated by self- improvement and driven by self. If we did not initiate God’s love for us, how can we have the power to sustain it or even cause God to disdain or discontinue it? If we did not provoke God to love us can we provoke God to un-love us? Can anything separate us from the love of God - a love that we did not initiate or create? Can anything separate God from God…from being love…from being God? At times we may feel disconnected from God through our sin, disobedience or by ignoring the spirit of God within us. Violating the greater laws of the universe can have a blinding and deadening effect on the senses, the conscience. We can easily slip into unconsciousness or the illusion of separation by our refusal to agree with the way of God. All of us have found ourselves estranged from the path of love and the way of God. However, no matter how disconnected we may feel, it doesn’t change God’s eternal essence as being love and loving us. Our illusion of being cut off from God’s love cannot overpower God’s pervading and prevailing love. The sun is always shining and emitting energy. Yet, the earth’s rotation, clouds or even an eclipse may create for those of us on the earth the illusion that the sun is not there - not being. The sun is always the sun and always there. Our illusion of being out of the reach of God’s love will never limit the reach of God’s love. Illusions can only limit our awareness of God’s omnipresent love. Illusions cannot provoke God to un-love us or force God to be anything other than God. Divine love is freely given and unearned. God’s grace transcends any relationship. God cannot relate any differently to one person than to another. Jesus makes this point very clearly when He says that God loves and forgives the wicked. They haven’t earned love through any action or love directed toward God. All they had to do was to exist. To be is to be loved by God. When my first child, Esther, was born I loved her immediately. When I saw her I was so overwhelmed with emotion that I began to cry. And then I cried some more. I actually began loving her when I saw her on a sonogram still inside her mother’s womb. Truth be told, I don’t buy the idea that all newborn babies are beautiful. They are bloody and messy and just a mess. I loved my Esther despite her messiness, because she was mine; an inseparable part of me. She did nothing to deserve or earn my love other than being mine…being my child. And, there is nothing she could do to cause me to not love her. I initiated the love and in time she responded to my love for her by loving me back. This parental love, although very strong, may be the apex of human love. I love my children because they are part of me. However, I hope that I am becoming love so that I will feel that way about all people, not just those with whom I am physically connected. We cannot limit God’s being love to our human understanding of love. Yes, God loves us as His children and as we are a part of Him. But, God loves us because God is love, not only because we are His children and happen to bear His likeness and image. Have you ever noticed that we love for our children to look like us? If we were honest we would admit that we have ourselves, or have at least seen someone, who loved a child more because the child bore a strong resemblance to them physically. This brand of human love is based in ego, self and narcissism. Although it is healthy to like what you see in the mirror, it may be unhealthy to stare with admiration at yourself all day. God has no issue with low self-esteem. However, if God were overly narcissistic and in love with Himself He may not have freely given His life as an atonement for us. God not only loves His image in us, His reflection in us, His likeness in us. God is love. If we accept that all men are children of God we must embrace that God loves all men as such – as His children. As long as men think they must earn the love of God they will see God’s love as a conditional response, and in turn will replicate conditional love toward each other – toward mankind. We need not learn how to love. We only need forget how to hate. We are born as love, unconditioned and innocent. Unfortunately we are conditioned to hate, label, judge, discriminate, exclude. We need to remember how to love, how to be love. Further, if we believe that we are created in God’s image then we can no longer justify God hating Himself in us. As we become aware of the love of God, and love as God, we will respond with love toward God. The more we love God, love ourselves, love our neighbor and all of creation, the more we become love. When this transformation happens, love will no longer be an action or a response. Love will become who we are. When we become love we begin to agree with the God in us and with the God as us. Knowing is a devastatingly destructive force, mutilating men, building walls of denominationalism, spawning silent cold wars between members of the human family. You are the knowing, not the known. One does not divine this by impressions or knowledge. What this means is that no matter how much you try to figure or calculate by means of impressions or knowledge, it will not prove the least bit useful. Therefore, separate yourself from the discrimination of figuring things out. To know without knowing, that is true enlightenment. The time has come to share one another’s spiritual riches. How can a God of love also hate? Can hate and love work together? Coexist? Doesn’t the Bible tell us God is love? God is love, and God is good. But, God is bigger than that. God is all! God is ultimate balance. God is all, all the time! If God establishes laws such as sowing and reaping, cause and effect, action and reaction that govern the universe, He does so from His essence as Father and expression as Teacher. In other words, God creates after Himself or after His nature so that the creation might learn more of the Creator by knowing itself. I am learning to understand God as a paradox, not as a contradiction. God creates the light and the darkness, good bacteria and bad bacteria, sunshine and rain. And, everything created has a part to play in the balance of the universe. God is working in all things a balance that is beneficial for creation, even if we cannot see the beauty of the paradox. God can be love and hate, and both can be true. This idea of God as all begs a very good question: Is the hate of God aimed at those He loves, or at the things which torment His loved ones and cause them to torture each other? The opposite of fact is falsehood, but the opposite of truth may very well be another profound truth. This book will describe mostly the love nature of God in an attempt to bring a little balance to His image, as I am confident the world has already been familiarized with the God of hate. Yet, for a moment, I would like to focus on the one thing God seems to hate the most (and it’s not homosexuals or women who wear pants). The thing God hates the most and considers the worst abomination is one who sows discord among brethren - Proverbs 6:19. This abomination seems to have more potential of maintaining eternal significance than other Levitical abominations. Of all the things God could detest, He chooses discord - division. Should we focus our attention on the things God hates in Leviticus like eating scavengers or touching a dead pig or wearing more than one fabric at a time? Honestly, these seem to be more culturally driven than eternally imperative. Can we deduct that if God hates division most…He loves unity most? If God hates for his children to be divided, wouldn’t God in turn love and celebrate when His children come together? In order for all of God’s children to come together we must decide to make the main thing… the main thing. Making the main thing…the main thing must become a conscious decision. This effort is a conscious one (one of conscience) that has the power to unhinge and dethrone the unconsciousness of division. If unity matters most to God, then unity is never at the mercy of doctrine or dogma. If peace matters most, then it is never at the mercy of our piece of understanding. So, what keeps us from unity and from peacefully coming together? Our piece! Our piece of truth, our corner on revelation, our angle of knowledge that all consist of what we think we know, keep people from unity. Our ownership of our little piece made up of traditions and dogmas keeps us from fulfilling Christ’s prayer that we would become one (John 17:20-26). So do we choose our piece or God’s peace? Will we swap our personal piece in exchange for God’s heart for universal peace? Can there be peace on earth as long as our piece is more highly esteemed? There is one underground river – but there are many wells into that river: an African well, a Taoist well, a Buddhist well, a Jewish well, a Muslim well, a goddess well, a Christian well, and aboriginal wells. Many wells but one river. To go down a well is to practice a tradition, but we would make a grave mistake (an idolatrous one) if we confused the well itself with the flowing waters of the underground river. Many wells, one river. That is Deep Ecumenism. I practice the tradition of Christianity. More specifically, I practice the tradition of Pentecostalism that rests under the umbrella of Christianity. And, it’s a beautiful one. I love the music, preaching and expression of my tradition. Yet although my tradition is beautiful to me, it is not God to me – and must not be. My individual tradition is only one well of many wells that are fed by the One River we call God. God is the eternally flowing river that is the Source of life for the universe. From the River of God, many smaller tributaries are created and fed. However, the tributaries are not God. The wells that are fed by God are not God. They come from God, carry the essence of God and may even carry a small portion of the greater vastness of truth we call God. There are many wells, but One River. To equate any one well with being God is idolatrous (declaring something equal with God that is not God). The insecurity of I Know drives us to all extents to prove that our piece of God equals the total God. Our piece of God is just that – a piece. And, as long as we all cling to our piece (our well) as the only piece, there will be no peace. If one starts with doctrines, the arguments are endless…But when one comes to the level of interior experience, that is where the meeting takes place…It is in this cave of the heart that the meeting has to take place. That is the challenge. I have as many questions as answers, and I’m convinced that we’re only scratching the surface. What I do know is that the pursuit of Jesus is leading us backward as much as forward. I am actually, for the first time in my life, more curious about what I don't know than what I believe. I think we all believe too much and know too little… The over certitude of many and most of the world religions have kept us from accessing, experiencing, expanding and expressing the greatest of the ethereal disciplines, the discipline of ‘Not Knowing’ and being at peace with, and actually becoming one with, the ‘Unknown.’ Anything else is probably an illusion! When you fully accept that you don’t know, you give up struggling to find answers within the limited thinking mind, and that is when a greater intelligence can operate through you. And, even thought can then benefit from that, since the greater intelligence can flow into it and inspire it. There is a secret, sacred place where man enters into communion with the Ultimate Mystery. This secret place is only discovered by a few. The few who find this place have surrendered their personal possession of power to the Greater Power. However, to surrender is not to quit or to stop; to cease or to discontinue. To surrender is to deliver up possession – in the context of finding the Way of Knowing…to surrender possession of the I Know. To be ‘poor in spirit’ does not in the least mean the thing we call ‘poor spirited’ nowadays. To be ‘poor in spirit’ means to have emptied yourself of all desire to exercise personal self-will, and, what is just as important, to have renounced all preconceived opinions in the wholehearted search for God. It means to be willing to set aside your present habits of thought, your present views and prejudices, your present way of life if necessary; to jettison, in fact, anything and everything that can stand in the way of your finding God. There is a sad story given us in the gospels concerning a Rich Young Ruler who missed one of the great opportunities in history – to follow the Christ. The gospel’s telling of this story is that Christ offered this young man eternal life, an endless journey, the Way of Knowing, but he turned away sorrowful because he had great possessions. 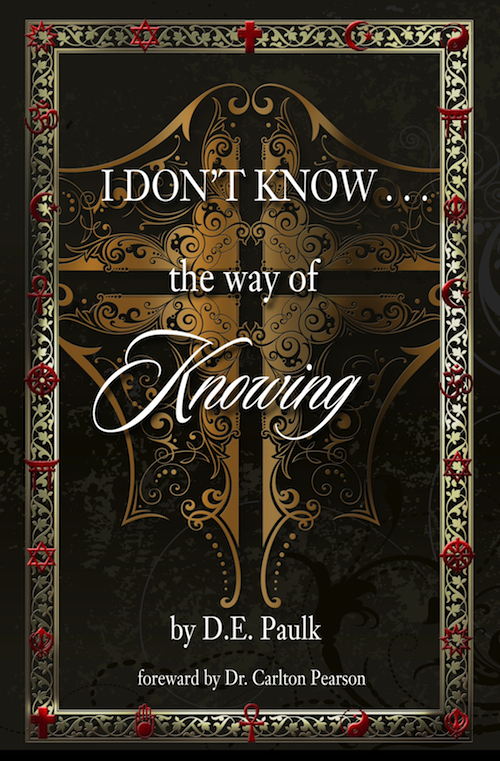 This too is the story of many religious, good hearted people, who live holy and seemingly sinless lives, but cannot surrender their possession of the I Know to follow the Christ into the Way of Knowing. Many religious souls will suffer in exile, isolated from the Spirit of Truth, because they have great possessions in the form of preconceived ideas. They have confidence in their own judgment and in the ideas with which they have become familiar and accustomed – their possessions. If this Rich Young Ruler was condemned solely on the basis and bias that he was wealthy - then Joseph of Arimathea (a rich man and secret disciple of Christ) would have also been condemned on the same condition as God is no respecter of persons. Joseph of Arimathea, unlike the Rich Young Ruler, had wealth, but did not cling to his possessions. It might be said that Joseph of Arimathea was not possessed by his possessions. Not only did Joseph of Arimathea use his wealth to secure the body of Christ and lay it to rest in a tomb, Joseph of Arimathea was also a committed and convicted Pharisee who was completely willing to walk away from the I Know of religion (his possessions) and into the Christ’s Way of Knowing. Joseph of Arimathea had heard of old, but was also open to hear the but I say to you of the Christ! When considering the severity (and longevity) of Pharisaical conditioning and indoctrination, Joseph’s openness and willingness to leave behind his acquired mental possessions to follow the Christ was quite remarkable. You cannot lose anything that is worth having through acquiring a knowledge of the Truth. Sacrifice there has to be, but it is only sacrifice of the things that one is much happier without – never of anything that is really worth having. Why did the sinners and non-religious of Christ’s day receive His message with joy? Because they had no possessions of perceived truth or preconceived notions keeping them from the Truth! There is a sacred place we can all access if we will surrender our possession of the known to the Unknown; to God. Yet, surrender is not our nature - or should I say survival is our human conditioning. The human in us surrendering to the spiritual in us is always preceded by struggle. Struggle is the essence of life. When we cease from struggle, we cease from living, at least physically. Life’s physical struggle begins immediately. We are born and instantly we struggle for air, food and water. Before long, we struggle to see and to walk and to talk. As we grow, we struggle socially as much as physically. The social struggle, though painful, is necessary to lead us to the spiritual struggle. Although the physical struggle seems to come first, it is temporary at best. The physical struggle, in time, turns into social struggle, which ultimately introduces us to the spiritual struggle. The spiritual struggle is deeper and has more eternal value. At some point we grow weary with the spiritual struggle, weary with the search for answers…and we surrender. It is in this arrival at spiritual exhaustion where we find the sacred place of mystery and mysticism; truths that transcend ordinary understanding. Struggle leads us to Surrender. Surrender is the Way of Knowing! Whether we admit it or deny it, we do! We grapple and quest for the answers of life, love, and yes, even God. We struggle because our souls thirst for awareness and our spirits hunger for awakening. And, deep in our being, we sense that we are not merely trying to survive. We accept that we are struggling to find ourselves. Where there is no struggle, there is no progress. Anywhere there is life, there is struggle. Wherever there is struggle, there is the potential for progress. Any place there is progress, we discover questions. Questions lead us to answers that lead to more questions. And, this process eventually leads all of us to surrender. Questions are proof of our humanity and of our Spirit. Questions are evidence that we have a soul and a spirit. Questions are confirmation of caring. We all are players on the stage of life. The universe is our audience. Yet, all we ever meet is ourselves. When we come into contact with ourselves, our role and our purpose, we find happiness and embrace the reality that we were consulted prior to being here, and that we agreed to be here. Finding happiness is the result of a process of searching for ourselves by struggling and asking. And, happiness is a knowing that this process will continue for a lifetime. All the world’s indeed a stage, and we are merely players, performers and portrayers, each another’s audience outside the gilded cage. I am persuaded that there is a director and a script. And questions seem to be the most reasonable method of understanding the script, learning more about the director and bravely complying with the character we chose to portray.